The agriculture has been the basis of the Valencian economy for centuries, combining different crops in each historical moment. But, certainly, one of them has been the key to development of the Valencian countryside in the last two centuries: Orange and its varieties. This culture has transformed the territory, industry and to many towns and cities. 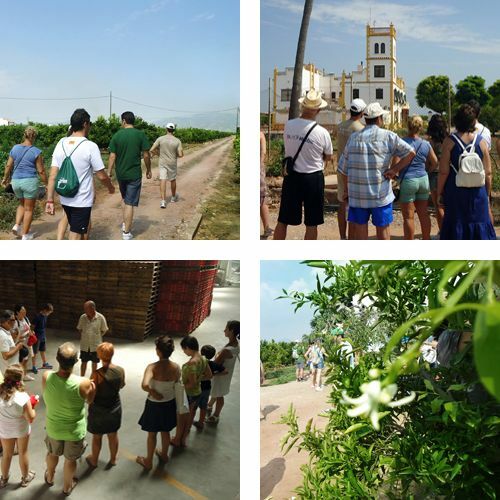 This Orange Tour take you a guided tour along quiet farm roads where you will discover the history of the crop, the cultivation of orange trees, the properties of the orange and the orange blossom and the architecture related to this crop . Also we will know the manufacturing process by a visit to a cooperative of citrus. If you come in harvest season, we invite you to collect your own oranges in an orange orchard, and out of season, we can include a tasting of derivative products such as orange liqueur, juice or beer with orange peel. It is a perfect outdoor activity for the whole family. Departure and arrival: Moncofa (Castellón). 45 min travel from Valencia. approx. Meeting point: Plaza de la Constitution (Moncofa). Duration: 2 / 2.5 h. 3.5 km plains. Difficulty low. To see: Orange groves. Rural architecture. Irrigation engines. Agricultural cooperative. WHEN WE DO THIS TOUR? – GROUPS: If you have a group of 15 people or more, we can arrange the tour from Monday to Sunday depending on your preferences. From October to February coincides with the harvest season. Contact us at +34 691 093 721 or at info@hortaviva.net.